The relationships among the morphology, trophic ecology, and use of food resources by fish fauna in a pristine stream in Iguaçu National Park (INP), Brazil were evaluated. 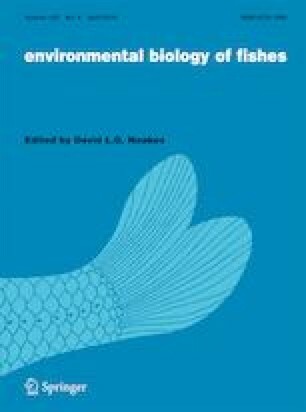 We expected that the trophic patterns would be explained by ecomorphological variations among fishes and the availability of food resources. Sampling was conducted quarterly from May 2015 to April 2016 using electrofishing. The stomach contents of 599 individuals belonging to nine species were analyzed using the volumetric method. Thirty-two morphological measures related to trophic ecology and body morphology were then converted into 10 ecomorphological indices. The fish assemblage consumed aquatic (Diptera, Ephemeroptera) and terrestrial (Hymenoptera) insects, other aquatic invertebrates, plants, and detritus/sediment. Therefore, the consumption frequencies of these food items were considered representative of their environmental availability. Furthermore, the fish fauna presented wide trophic niche breadths and little diet overlap. Principal component analysis (PCA) was used to classify the fishes’ ecomorphological variations into three ecomorphotypes. The benthonic ecomorphotype comprised species with more depressed bodies that eat detritus/algae and dipteran larvae (Ancistrus mullerae and Corydoras carlae). The nektobenthic ecomorphotype included species with elongated bodies and wider heads and mouths that eat aquatic insects and Aeglidae (Trichomycterus stawiarski and Rhamdia spp.). The nektonic ecomorphotype contained species with more compressed bodies and terminal mouths, which are generalist consumers of allochthonous and autochthonous resources. Morphology was significantly correlated with diet, which suggests that ecomorphological variations together with the availability of food in the environment are the main mechanisms underlying trophic segregation and coexistence among species. The online version of this article ( https://doi.org/10.1007/s10641-019-00871-w) contains supplementary material, which is available to authorized users. We thank the Universidade Estadual do Oeste do Paraná (UNIOESTE) for the support needed to perform the analyses, Fundação Araucária for granting a scientific-initiation scholarship to the first author, and members of the LIEB (Laboratory of Ichthyology, Ecology and Biomonitoring) at UNIOESTE for helping with field collections and the processing of parts of the studied materials. Fish were collected with authorization from the Instituto Chico Mendes de Conservação da Biodiversidade (ICMBio) (license numbers 30,182 and 25,039–1). All sampling and handling procedures were approved by the Ethics Committee on Animal Use of the Universidade Estadual do Oeste do Paraná (CEUA) in accordance with their protocols for the ethical and methodological use of fish (project approved on February 11, 2014).